Tommy Wright has backed his assistant, Callum Davidson, to one day replace him as St Johnstone manager. Davidson and youth coach Alec Cleland filled in for the Northern Irishman as he recovered from gall bladder surgery, recording back-to-back wins over Hibernian and St Mirren. And Wright hopes to pass on the reins to his number two in the future. "The plan is for me to be in this job for as long as possible and then for Callum to take over," he said. "That is something the chairman and I have discussed and we've talked about it with Callum as well. He and Alec have been really good and I knew they would be. "They are good honest people with a lot of knowledge about the game." 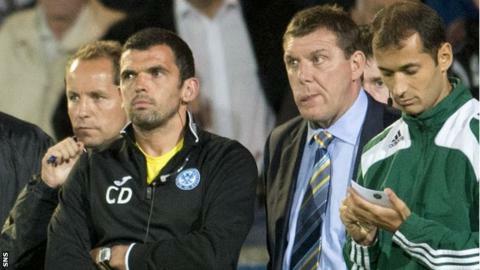 Wright was back in charge for the 1-1 weekend draw with Partick Thistle at McDiarmid Park but watched from the stands. And, having been told to take it easy by his doctor, the 50-year-old will do the same when his side visit Kilmarnock on Saturday. "I won't be back in the dug-out on Saturday," said Wright. "I'm going to give it another week. "I'll be out doing the training today and I've been in the office for a couple of hours this week, but I'll be sitting in the directors' box again for the Kilmarnock match. "I will be in the dressing-room before the game and again at half-time, but I will stay away from the dug-out for another week. "I was happy enough in stand. It's a more calming experience up there and you do get a better view. "It might be something we look at doing more often going forward."